Opposites attract as gothic embellishments, hoodies and flamboyant outerwear play off fringes and airy chiffons. 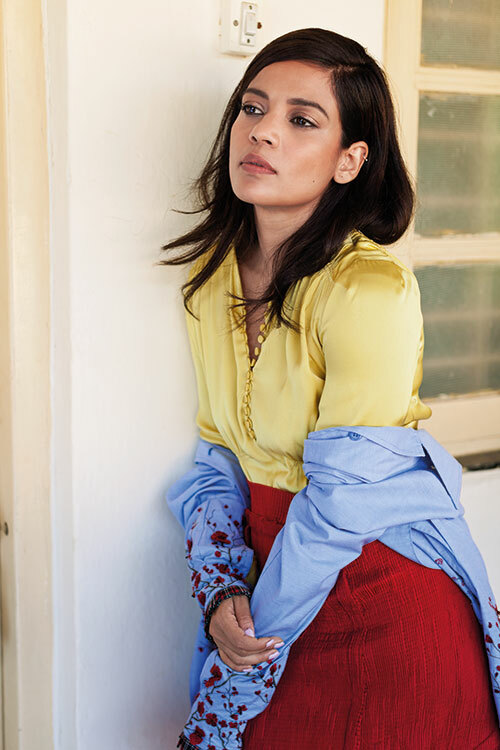 All full-time moms juggling full-blown careers — Priyanka Bose and Bhawna Sharma, with model turned photographer Sheetal Mallar behind the lens —embrace their fastidious and whimsical sides. On Priyanka: platinum embellished maxi dress, by Sonal Verma, for Rara Avis, New Delhi. Salmon hoodie, from H&M, Mumbai. On Bhawna: Asymmetrical dress with ruffles, by Pankaj and Nidhi, New Delhi. Cloud grey dress, by Anavila, Mumbai. Pink stockings, stylist’s own. On Bhawna: ivory silk gown with ruffles, by Gauri and Nainika, New Delhi. Bordeaux and blue hoodie, from Zara; black joggers from Adidas Originals; black and white sneakers, from Nike. All in Mumbai. On Priyanka: striped shirt dress, from Carol’s Shop, Nagaland. Quilted trousers, from Lovebirds; silver, gold rings, from Metallurgy. Both in New Delhi. Ivory T-shirt from H&M; bordeaux embroidered ankle boots, by Christian Louboutin X Sabyasachi. Both in Mumbai. Embroidered powder blue shirt, from Huemn; scarlet pleated skirt, from Akaaro. Both in New Delhi. Dandelion yellow twill dress, from Dior, Mumbai. On Priyanka: white neoprene drop waist dress, by Aniket Satam; multicoloured embroidered bomber jacket, from Diesel; snow-white sneakers, from Adidas Originals. All in Mumbai. 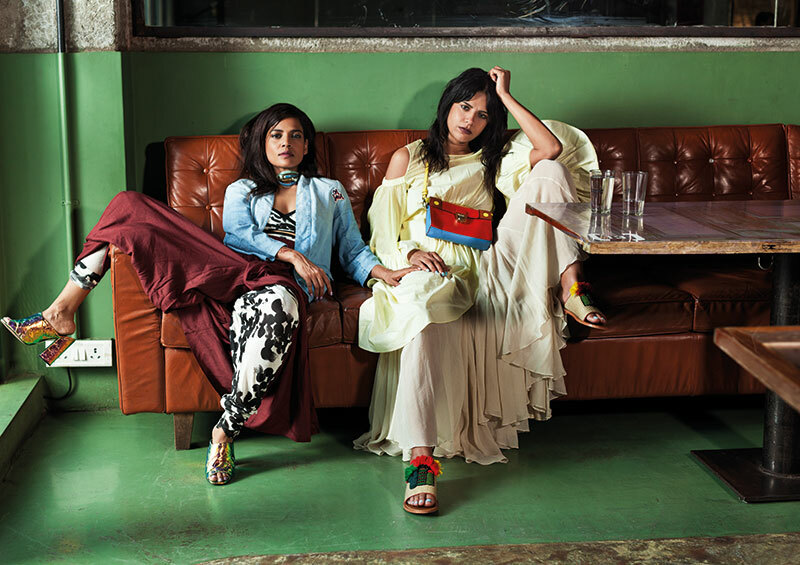 On Bhawna: olive green silk skirt, by Sonal Verma, for Rara Avis, New Delhi. Oversized utilitarian shirt, from H&M; small Lady Dior bag in cinnamon cannage lambskin with embroidered luggage tag and golden owl charm, from Dior; black and white sneakers, from Nike; embroidered choker, by Maiti Shahani. All in Mumbai. Platinum silk dress, by Rohit Gandhi + Rahul Khanna, Noida. Denim shearling jacket from Gas; black knit top from Zara. Both in Mumbai. Sherbet orange sheer tunic, from Akaaro, New Delhi. Patchwork embellished trousers, by Sanchita, Bengaluru. Bralette, from H&M; black lambskin platform low boots, from Dior. Both in Mumbai. On Priyanka: floral print jumpsuit with cutouts, by Malini Ramani; berry asymmetrical draped trouser, from Antar-Agni. Both in New Delhi. Wild in Dior bracelet (worn as choker), from Dior; holographic gold clogs, from H&M. Both in Mumbai. Chambray jacket, from Postfold at postfold.com. On Bhawna: chartreuse yellow parachute dress, by Amit Aggarwal, for AM.IT; eggshell flared chiffon pants, by Arjun Saluja, for Rishta. Both in New Delhi. Embroidered and embellished sandals, by Sanchita, Bengaluru. Diorever Squad bag from Dior, Mumbai.